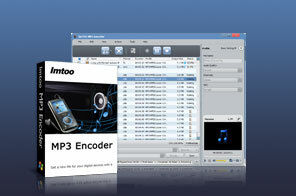 ImTOO MP3 Encoder is the ultimate solution to playing songs and music videos in different formats on different MP3 players as the MP3 encoder software supports decoding almost all audio and HD/SD video formats including WMA, WAV, AAC, FLAC, OGG, APE, AVI, MPEG, MP4, WMV, H.264/MPEG-4 AVC, AVCHD, and many others. Besides offering the easiest way to encode MP3 audio, this MP3 encoder software also allows you to extract any music segment, customize output file size freely, add and adjust audio effect, edit ID3 tag info, and set different output parameters for outputting the files with the quality and parameter you want. ImTOO MP3 Encoder can batch multiple MP3 conversion tasks at high speed with multithreading and multi-core CPU processing fully supported. Converts WMA, WAV, AAC, FLAC, OGG, APE, and many other audio formats to MP3 files. Decodes AVI, MPEG, WMV, MP4, FLV, MKV, H.264/MPEG-4 AVC, AVCHD, and other popular video formats including HD videos and converts them to MP3 audio. As the MP3 encoder software fully supports multithreading and multi-core CPU processing, you convert the video and audio files to MP3 audio at incredibly fast speed. Load batches of video and audio files, and get them converted to MP3 audio files simultaneously. Offers more audio effects to add and adjust into audios. Convert any segment to MP3 file with its start time and duration preset before conversion. If you got a file that's too large, then set a split mode before conversion to split it into several parts. You can also edit ID3 tag info for better MP3 file management. "Add Effects" function lets you create your own MP3 file by adding and editing various audio effects (such as fade-in, fade-out, band pass, chorus, flanger and echo). The built-in Bitrate Calculator tool simplifies the customization of output file size. Tweak the output parameters at will to change the default settings and get custom MP3 audio files. A built-in media player enables you to play the video and audio files and take video snapshot anytime during playing. If you got something more important to do on your computer, then setting your MP3 converter to work in the background is a good choice. Making ImTOO MP3 Encoder to auto exit, shut down, stand by, or hibernate your PC after a task is complete saves your time greatly. You can specify the interface language as English, German, Spanish, French, Japanese, Simplified or Traditional Chinese.